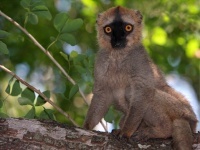 The Berenty Reserve is a small private reserve set along the Mandrake River in Southern Madagascar. Its gallery forest and array of indigenous wildlife and birds, such as ring-tailed lemurs, white-browed owls and giant couas make it an eco-tourist's dream. The de Heaulme family first formed the Berenty Estate to conserve the natural forest in the area. Through their efforts with the Tandroy tribe, more than 2500 acres (1000 ha) of forest has been maintained. For its relatively small size, the reserve has a remarkable variety of topographies, ranging from dry, open scrub, 'spiny' forests, and closed canopy jungles. Day visitors can enjoy a walking tour through the wilderness, while others can stay longer at the guest lodge. Get up close and personal with nature at the Berenty Reserver, where the semi-tame sifaka and ring-tailed lemurs often sit with guest as they eat.